Teenagers need a lot of sleep to manage the increasing demands of their busy lives. School work, socialising and new responsibilities take it out of you. You need much more sleep than an adult because your brain is still doing a lot of growing. As you grow older, your body clock shifts. You get tired later in the evening and wake up later in the morning than younger children. You actually need the same sleep as younger children, or more. Unfortunately, this conflicts with everyday life. You're often forced to get up hours before your body is ready. Teenagers who set their own bedtimes usually end up with a sleep shortage that has built up over weeks and months. 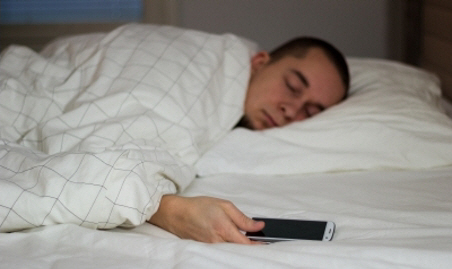 Another thing that stops teenagers getting enough sleep is the use of screens. If you watch TV or play with devices in your room at night, you're often doing this instead of going to sleep. Brightly lit screens reduce your body's ability to produce melatonin, a hormone that helps make you feel sleepy. While you might think you're using your screen to relax until you can sleep, your device or TV is actually keeping you awake. As a result, if you regularly use screens at night, you'll end up with an even greater sleep shortage. This can lead to low mood and energy, poor school performance and lots of other difficulties. Teenagers are gaining independence and making their own choices in many areas of life. But teenagers whose parents set their bedtime have less depression and suicide. Try to have a regular bed time and waking time. Make your bedroom device-free. This will make a big difference in how refreshed you feel when you wake. It will also have positive effects across all areas of your life. This page talks about how much sleep teenagers need and how to tell if you're getting enough sleep. This website aims to help young New Zealanders with depression and anxiety. This Australian website has some excellent information about sleep problems in teenagers. It covers topics like teenage sleep, good sleep habits and more. This page explains why it's important to limit your access to phones and screens in your bedroom. Written by HealthInfo clinical advisers. Endorsed by the Youth Specialty Service and clinical director, Sleep Unit, Canterbury DHB. Last reviewed April 2019.